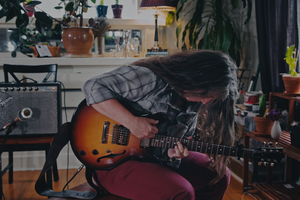 by Dirk VanderHart Follow and Lauren Dake Follow OPB Jan. 18, 2019 4:30 p.m. | Salem, Ore. The 2019 session of the Oregon Legislature kicks off Jan. 22. With Gov. Kate Brown's re-election and new supermajorities in both chambers, Democrats will bring an ambitious agenda to the Capitol. In the upcoming months, Oregon lawmakers want to tackle an ambitious slate of policy proposals, from first-in-the nation statewide rent control to injecting billions into the state’s flagging schools to curbing carbon emissions. The 2019 legislative session kicks off on Tuesday. Democrats come into Salem enjoying the most significant advantage they’ve seen in decades: They have newly won supermajorities in both the Senate and House of Representatives and a just re-elected governor who never plans to run another campaign. House Majority Leader Jennifer Williamson, D-Portland, said she doesn’t believe the session will be particularly partisan. “Although folks expect it,” she said. Republicans hope to find common ground where they can, but in the face of that dominance, House Minority Leader Carl Wilson recently said members of his party also see themselves as “not even legislative speed bumps,” nearly powerless to stop a unified Democratic front. 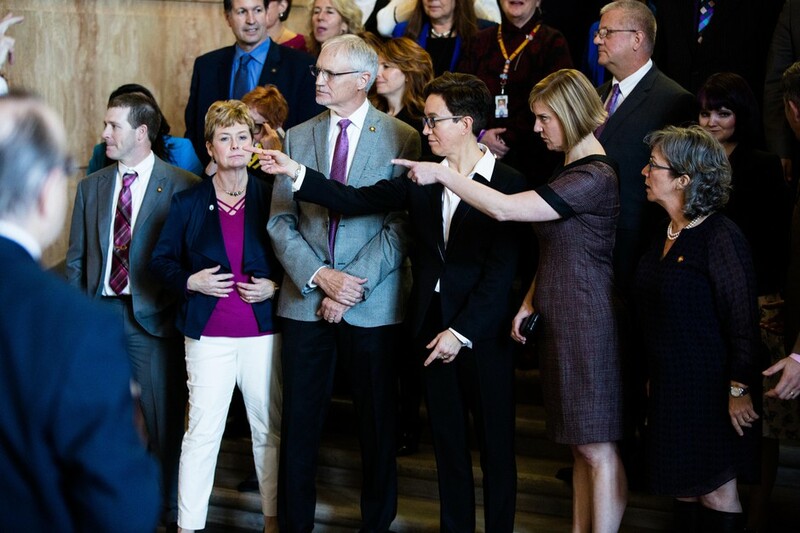 From left, Rep. Sherrie Sprenger, R-Scio; Minority Leader Carl Wilson, R-Grants Pass; House Speaker Tina Kotek, D-N/NE Portland; and Majority Leader Jennifer Williamson, D-Portland, prepare for the official Oregon House portrait on Monday, Jan. 14, 2019. While many aspects will undoubtedly be similar to the 2018 proposal, questions remain. For instance: How many free credits are given to polluters in order to prevent them from leaving the state? How fast will the emissions cap will lower? (The state’s ultimate goal is to hit emissions that are 80 percent below 1990 levels by 2050.) And how exactly will money generated by auctioning credits be spent to help Oregon further reduce emissions? Also unknown: whether any bill that passes would be referred to the ballot by opponents, who believe cap-and-trade would be too expensive for Oregonians while barely contributing to reducing global emissions. A ballot referral could result in an expensive, highly contentious fight for voters’ favor. The judiciary committees in each of the Legislature’s two chambers see an intense volume of bills each session. Many are simple wording fixes to existing laws, but judiciary members also get the first crack on weighty issues like gun control, criminal sentencing and more. A flurry of new gun-control bills include proposals raising the age to purchase a gun to 21, requiring gun owners to lock up their weapons, and closing a loophole in the background check process for gun buyers. All of those have backing from Brown and some powerful lawmakers. 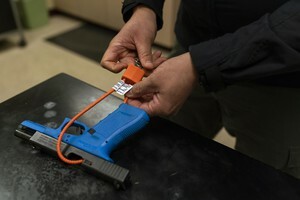 Less likely changes include a proposal that would outlaw magazines that hold more than five rounds of ammunition, limit how many bullets a person could buy in a month and require a permit to purchase a gun. That proposal has been decried by gun advocates recently, but it’s unclear such a strict bill has any chance in a Capitol where gun rights views don’t always follow party lines. Members of the judiciary committees are also likely to take aim at an Oregon law allowing juries to convict criminal defendants without a unanimous verdict. Oregon is now the only state in the country with such a policy, and lawmakers appear ready to ask voters to strike it from the state Constitution. Also possibly up for discussion: gutting the death penalty, preventing juvenile offenders from being sent to the adult prison system, and reforming Oregon’s troubled public defense system. 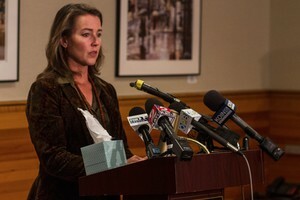 Brown has since said she wants lawmakers to refer a measure to voters that would modify the state’s Constitution, which the Oregon Supreme Court has ruled currently bars any limit on campaign contributions or spending. “We’re working with lawyers and stakeholders to see if we can figure out an approach to amend the Constitution to allow for reasonable campaign finance limits in Oregon,” Brown told reporters on Jan 14. 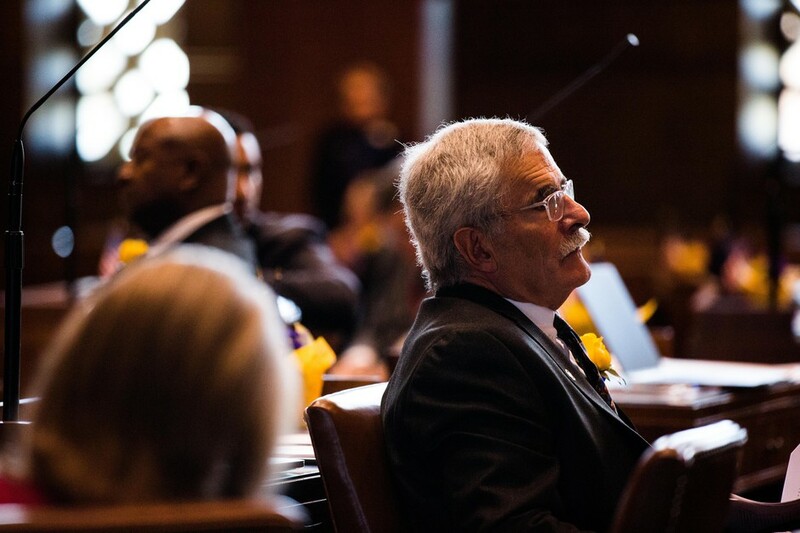 State Sen. Jeff Golden, D-Medford, listens to arguments on the floor of the Oregon Senate on Monday, Jan. 14, 2019. The Oregon Capitol in Salem, Oregon, on March 18, 2017.
, a move that the governor’s office expects to result in a ballot fight. Beyond funding, lawmakers expect to take up prescription drug prices, curbing the growth in health care costs and improvements to Oregon’s mental health system. A group of Oregon lawmakers spent much of 2018 traveling the state listening to students, community members and school officials. Their goal was straightforward: gather input on why the state’s school system is failing. The solution, however, will be harder. The legislative committee came up with a long wish list, ranging from extending the school year to lowering class sizes to offering before-and-after school programs to ensuring every student has a school counselor available to them. “Mental health and social needs and early learning are [some of] the biggest gaps. … We have so many kids with no exposure to school before kindergarten, we have more trauma in our lives, food insecurity, housing insecurity,” Smith Warner said. This legislative session, Democrats have said, could be a game changer if they can address the state’s failing and chronically underfunded schools. Oregon Gov. 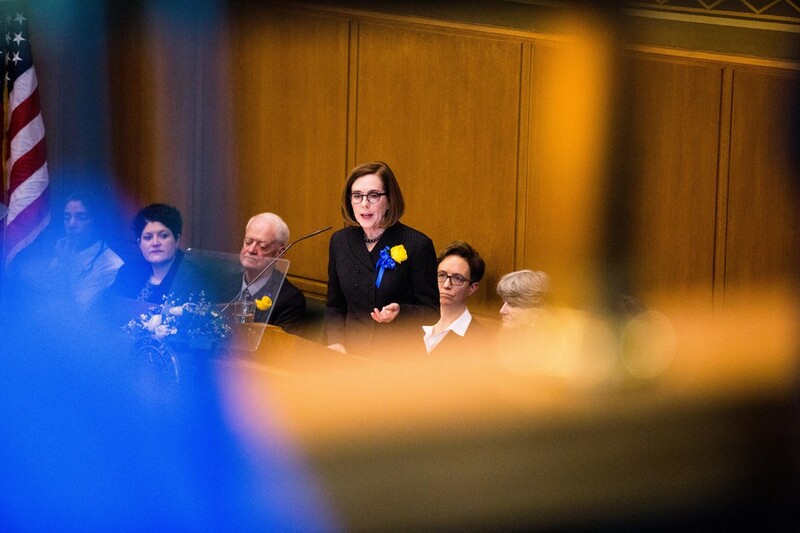 Kate Brown delivers her inaugural address in the state House of Representatives on Monday, Jan. 14, 2019. State Sen. Mark Hass, D-Beaverton, in the Oregon Senate on Monday, Jan. 14, 2019.
, Hass said. 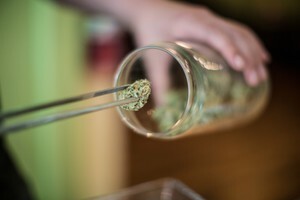 The more conservative Oregon Business and Industries is also pushing ideas. Hass believes any proposal signed by Brown would likely be referred to voters. Corporate income taxes are expected to account for just 4 percent of the $23.8 billion general fund/lottery fund budget the state anticipates in the next biennium. Roughly 80 percent of that budget comes from personal income taxes. Oregon could become the first state in the nation to have statewide rent control. A measure to cap how much landlords can raise the rent already has support from legislative heavyweights, including the governor and leaders of both the House and Senate. As the legislation is currently crafted, it would prohibit landlords from raising the rent by more than 7 percent annually, plus any additional uptick in the consumer price index. It carves out an exception for any building newer than 15 years old. Overall, landlords would still have the ability to raise the rent at whatever level they want if a tenant voluntarily leaves the property. The same bill would also make it harder for landlords to evict their tenants without cause. If a renter has lived in an apartment for a year, the landlord could only evict the tenant if they have a reason. If a landlord evicts within the first year, they must give their tenant 30-days notice. Lawmakers pushed for similar measures in previous legislative sessions, but couldn’t muster the votes to pass it into law. Legislative leaders initially said they moved the legislation to the Senate Rules Committee, chaired by Burdick, with the goal of moving it swiftly out of the Senate. It was later moved to the Housing Committee. 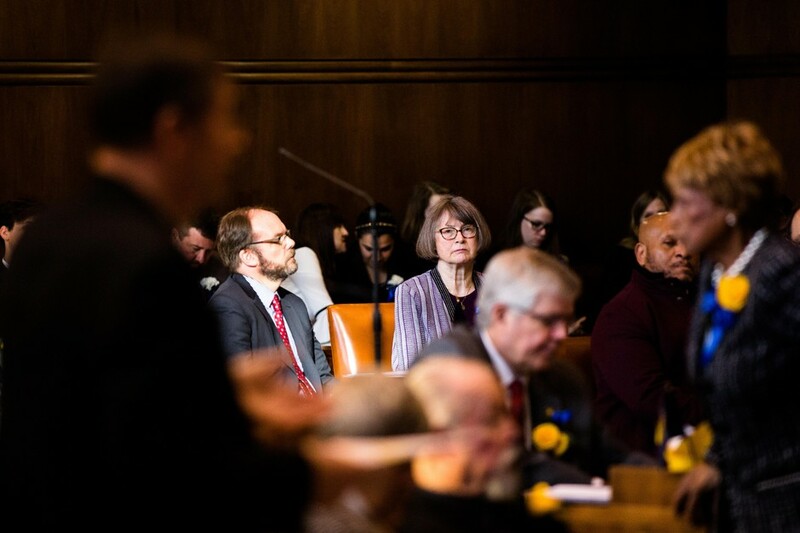 Senate Majority Leader Ginny Burdick, D-Portland, listens to arguments on the floor of the Oregon Senate on Monday, Jan. 14, 2019.
units of permanent housing to target people who are currently homeless. And several other ideas have also been floated, such as one by House Speaker Tina Kotek, D-N/NE Portland, to ban single-family zoning for cities larger than 10,000. Across the country, state governments have struggled with how to shift the culture in places where the power structure presents significant challenges. In Oregon, the Legislature was rocked when two state senators filed complaints against then-lawmaker Sen. Jeff Kruse, R-Roseburg, in 2017. An independent investigator revealed Kruse had a “longstanding pattern” of harassing behavior, including two interns in his office. Several months later, the state’s labor commission released a blistering report finding that the Oregon Capitol is a hostile work environment and that legislative leaders have allowed sexual harassment to fester at the Statehouse. 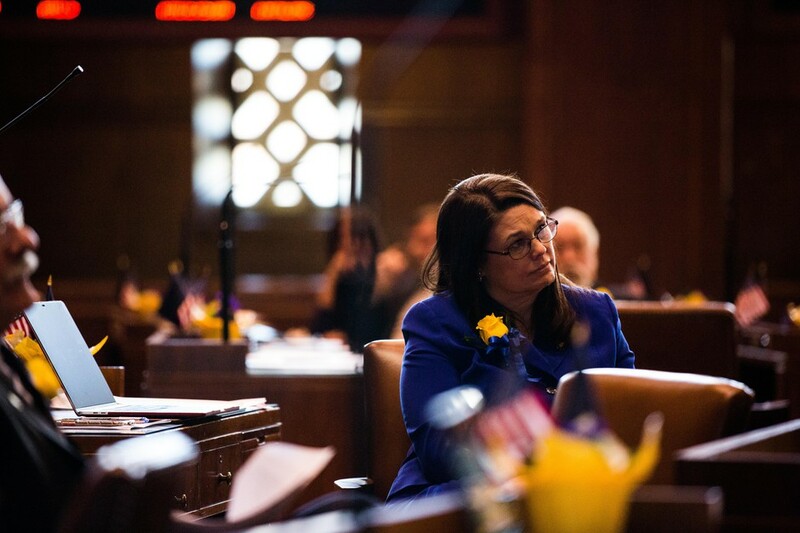 State Sen. Sara Gelser, D-Corvallis, listens to arguments on the floor of the Oregon Senate on Monday, Jan. 14, 2019. At the top of their list is creating an equity office. The Legislature would have to approve and fund the office. The task force suggested two people should be hired to work in the office. One person would be charged with investigations and making interim safety recommendations. The second staff person would oversee training, conduct regular climate surveys, and provide a confidential process counseling to any individuals that explain how to make complaints. A newly created Committee on Culture is tasked with turning the recommendations into law.